Since opening in 1946, the Owl Shop of Worcester has been serving the finest tobacco products the world has to offer. Towards the end of World War II, George Photakis and his brother-in-law Joseph St. John, decided that Worcester Massachusetts, would be a great place to open a store to service the desires of smokers in the Northeast and beyond. For over 60 years, George, and his staff have serviced hundreds of thousands of customers who have crossed the doorsteps of the Owl Shop and savored the flavors and aromas of fine tobacco, be it cigars, pipe tobacco, imported cigarettes, or roll your own cigarette tobacco. Custom blended pipe tobaccos such as Harkness Towers, Bay State House and WB#3 have been smoked by pipe smokers all over the world. Cigars have always been a specialty in the Owl Shop, featuring all brands such as Arturo Fuente Opus X , Davidoff from the Dominican Republic, to the ever popular Padrón 1926 from Nicaragua. If we are out, we will have the expertise to suggest alternative choices. John Photakis joined the family business in the late 70s, and brought with him his knowledge of pipe making learned from old world pipe makers from the New York City pipe shops. John managed to find a small group of old-timers who were reluctant to train new apprentices at first, but slowly they gave him the time and knowledge. After purchasing ancient tools of the trade, John began making his own line of custom-made pipes and sold them exclusively through the store. With the knowledge learned by making pipes, the process of purchasing other brand name pipes became a consumer's dream. In 2002 John passed on in a fatal car accident. Leaving us at the young age of 51, he will be greatly missed. With John's passing, his son Zack then joined the family business full time. As the third generation of family, Zack has grown up in the store with great knowledge of the product and industry. 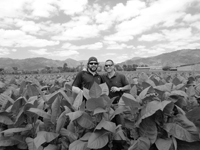 Traveling to foreign countries, studying the tobacco process from start to finish, Zack has established an amazing variety of the best tobacco grown throughout the world. His love and passion for the tobacco industry will continue to make the Owl Shop stand out as one of the premier tobacconists in New England. Here at the Owl Shop we are not only a full service tobacconist, we are also purveyors of fine gifts. Whether it be a swiss movement Reuge music box, straight razor and shaving brush, or crystal ashtrays and desk pieces, we have it here in the finest quality. Choose from our large selection of the best smokers accessories money can buy from S.T. Dupont, Dunhill, Davidoff, Xikar, and Savoy. Groomsman gifts such as flasks, money clips, leather goods, and gift sets. Be sure to check out our selection of Zeiss, Swarovski, Selsi and Pentax binoculars. Our wide variety of Hookahs and tobacco, along with an extensive selection of rolling machines and R.Y.O products, leaves something for everyone. Everything you could possibly need all under one roof, with the continued exceptional service you have received and expected for the last 65 years. Welcome to the Owl Shop.